Congratulations to the winners of CSUN’s 2018 Matador Moments: Freshman Challenge! Matador Moments was aimed at inspiring fellow Matadors by sharing stories from all students about a moment of connection to CSUN during their first year. Read more about this Challenge and future opportunities at the Matador Moments website. 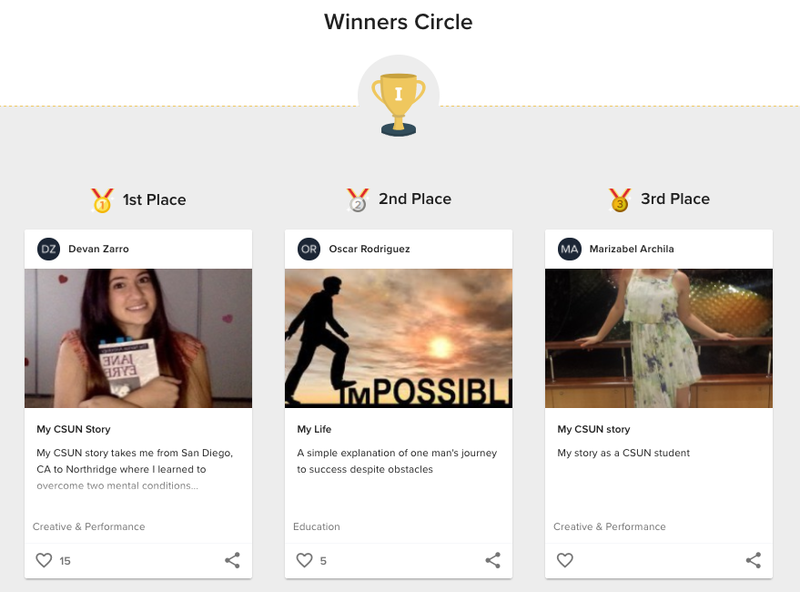 Congratulations to our three winners from the November 2016 "myCSUNStory" Portfolium Challenge, sponsored by the Office of Institutional Research! We received 65 amazing CSUN Stories which can be viewed on the MyCSUNStory Portfolium Challenge Page. Congratulations to our three winners from the February 2016 Portfolium Challenge, sponsored by CSUN's Office of Community Engagement! Congratulations to our three winners from the November 2015 Portfolium Challenge! The criteria for this challenge was (1) profile completeness and (2) at least two high quality entries. Over 500 submissions were received for the November challenge. Entries were judged by a committee of CSUN students and staff.